One of the basic concepts of Keynesian economics is that real activity is heavily driven by the pace of investment. The household sector is largely a passive actor; shifts in investment activity are the source of economic volatility. In this article, I outline a preliminary model of investment, with the financial aspects stripped away. It is a stock-flow consistent (SFC) model, which is built upon the core of the sfc_models package, written in the Python programming language. 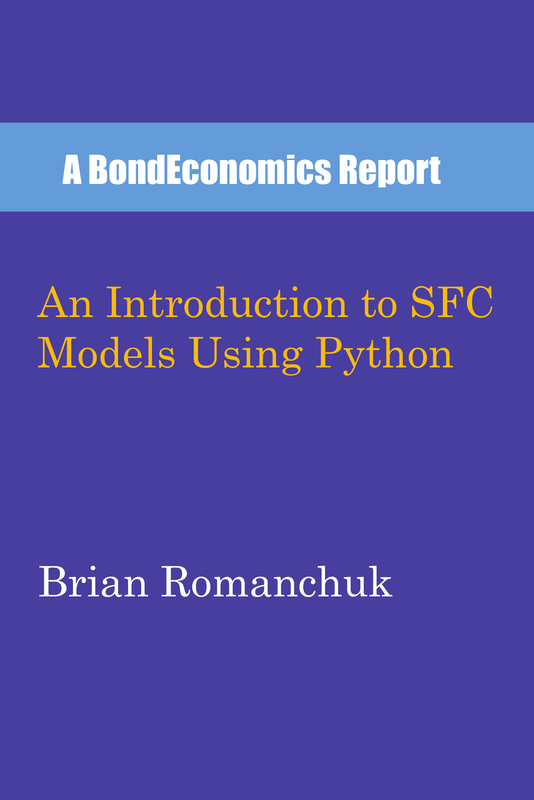 (That package is described in my book, An Introduction to SFC Models Using Python.) The code that generates the model has been added to the examples folder of the package at (link to GitHub). Although it may have been more sensible to take an existing model, my preference was to create the simplest possible model with investment. This is for ease of understanding, as well wanted to keep additions to the sfc_models package as incremental as possible. The core of the model is model SIM (for "simplest"), which is found in chapter 3 of Wynne Godley and Marc Lavoie's Monetary Economics (and described in chapter 5 of my book). The SIM model has three sectors: households, businesses, and the government. The investment model was created by solely changing the behaviour of the business sector. Readers need to be cautioned that this model would not be considered the best summary of (post-)Keynesian thinking on the effects of investment. 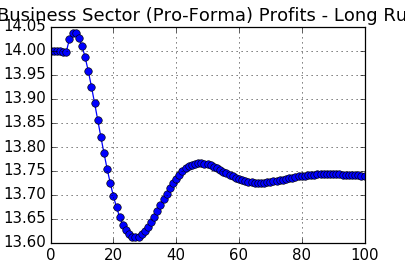 This is a stripped down model that just looks at the somewhat mechanical income flows that occur between the sectors. Although these income flow effects are enough to generate a moderate business cycle, they are not enough to explain the greater volatility we see in the real world. The introduction of the financing aspects of capital investment will inject greater volatility into the model. However, considering the financial aspects increases the complexity, and overshadows the investment accelator mechanism. Since the model description may be too dry for many readers, I will jump ahead to describe the effects of a jump in private sector investment in the model. We are following the convention of Monetary Economics, and setting the model up in a no-growth steady state. We then perturb model settings to see the effects on variables. In our example, we change the target level of capital in business sector, and leave everything else unchanged. The target capital is set as a ratio relative to the size of the employed labour force, and we change the ratio in time period 5. This causes a jump in gross investment in that period (above). In this model, 5% of the capital stock depreciates. With a steady-state capital stock of 100, this means that gross investment of 5 units of output is needed to keep the capital stock unchanged. The adjustment of capital target is not instantaneous. 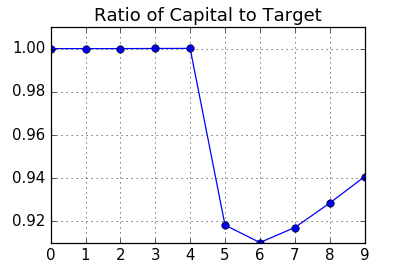 Since the target ratio jumped in time period 5, the ratio of capital to target fell to about 0.92. It then is marching slowly towards its target level during the rest of the sample period. In order to increase investment, hiring needs to increase. 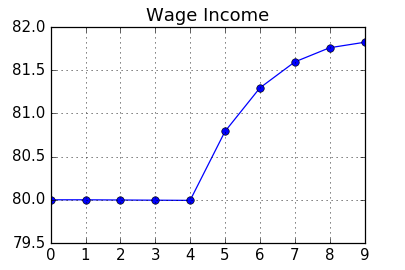 As seen above, the wage income of the household sector rises from 80 to almost 82 by the end of the sample. An increased wage bill feeds through into greater demand for consumer goods. The business sector uses the previous period's sales as a forecast for the current period (a very simple adaptive expectations), and it underestimates demand from the other sectors. (It knows what its own investment plans are.) This forecast miss is accommodated by drawing down inventories. As is typical for post-Keynesian models, the business sector follows conventions. 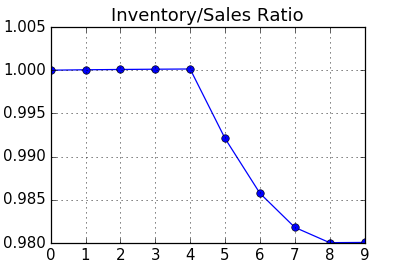 In this case, it has a stock-flow norm: it wants to keep the inventory (a stock) to sales (a flow) ratio at 1. The forecast miss meant that this ratio is below target. As a result, in addition to meeting higher-than-expected demand, it also needs to build inventories. Since inventory builds are a form of investment, we see that total investment ends up being pushed higher by the earlier step up in fixed investment. The net result of all these forces is depicted above: total production rises from 100 to just over 102 by the end of the sample period. 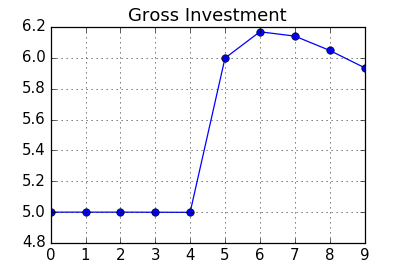 Since fixed investment rose by about 1, we can see that there something like a short-term multiplier on investment of about 2. The fact that total output rises by more than the direct impulse of investment explains how fixed investment can be a major driver of economic volatility. If we look at a longer time period, we see that effects of the change are less uni-directional. 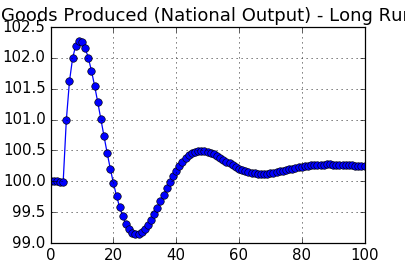 In fact, we see an oscillation in output. That is, there is a bust after the the period of boom. However, the oscillations are damped, and the system is converging towards a steady state. There are a lot of moving pieces in the model, but the best summary is that investment -- both in fixed capital and inventory -- overshoot, and then the excess needs to be worked off. Demand from the other sectors is unable to validate the peak investment levels. Government policy only appears in this model via fiscal policy. 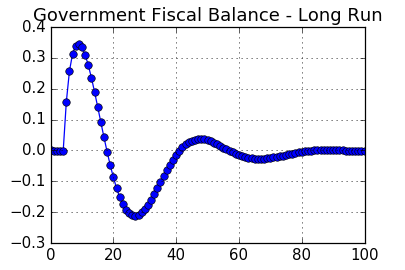 Since the economy is not growing in nominal terms in the steady state, the steady state fiscal balance has to be zero. Once investment picks up in period 5, tax receipts jump while government consumption remains fixed. As a result, the government moves into surplus. In other words, even though fiscal policy settings (the tax rate, spending) are unchanged, the fiscal balance automatically moves to counter-act the private sector movements. One small point to note is that the inclusion of private investment slightly increases the steady state multiplier on government consumption. As discussed by Godley and Lavoie in Monetary Economics, the level of the output in steady state is a multiple of government consumption. The inclusion of the need for the business sector to replace depreciating capital raises steady state activity. 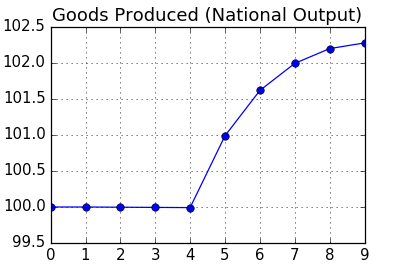 Using the parameter values used in Monetary Economics (which this simulation also uses), the multiplier was 5, so government consumption of 20 supported production of 100. In the simulation, the steady state government consumption dropped to 19. The investment model features variable productivity, but the initial steady state was chosen so that the productivity for both models are equal (at 1). Although one might think that capital deepening would raise output, the effect was fairly marginal. The explanation appears to be that the model uses a rather neoclassical production function, and so the marginal efficiency of the extra capital is low. The extra depreciation expense due to a higher capital stock actually reduces steady-state profits in the long run. Since those profits flow through to the household sector via dividends, the lower profits reduces final demand. The point that must be underlined that this model is a stepping stone to more interesting analysis. By itself, it is a misleading interpretation of the (post-)Keynesian view of business cycles. (I am not including the so-called New Keynesians in that group, as they are effectively Monetarists with sticky prices, and have largely retained the classical view of business cycles.) The fuller explanation would show up in later sections of the chapter on post-Keynesian views in my book. The cyclical succession of system states is not always clearly presented in the "General Theory." In fact, there are two distinct views of the business cycle, one a moderate cycle which can perhaps be identified with a dampened accelerator-multiplier cycle and the second a vigorous "boom and bust" cycle. In chapter 18 (GT, pp. 249-54) Keynes sketches a model of a moderate business cycle that might very well be the prototype for the various nonexplosive accelerator-multiplier interaction models. The business cycle as described is based upon a modest multiplier and a moderately fluctuating prospective yield on investment. This model is an SFC implementation of such an accelerator model. We need to dig into the mechanics of how business investment is financed to get models that generate severe booms and busts. Minsky's argument was that Keynes' own explanations of how the financial forms of capitalism generate booms and busts was muddled, which allowed the Old Keynesians to mangle the theory, and revert back to the neoclassical synthesis. I will now turn to some of the various critiques I have seen in the context of SFC models. Naïve empiricism. The argument is that we need to pretend to be physicists and immediately fit our models to data. As someone with training in engineering, I would respond that we are facing a complex system, and physicists generally run from complexity and try to isolate underlying principles in simple systems. However, we do not have that luxury when dealing with complex systems. Yes, there are empirical recession models, as I discussed earlier. As I noted, we have no idea what variables we should use for recession forecasting models without having some kind of theory justifying the choice. We need to ask ourselves: what variables will matter? If we look at a broad class of models that properly account for all income flows -- such as this model -- we see that those models feature an investment accelerator mechanism. This gives us a strong hint that our empirical research programme should focus on variables related to investment. Rush to pet models. One common reaction when faced by a mathematical model is for readers to suggest dozens of other mathematical models to look at. There's an infinite number of mathematical models. We should just focus on what useful lessons we can draw from simple ones before we rush off to include every possible theory about economic activity (e.g., what are the banks doing? etc.). We now turn to a fuller description of the model. Those of you who are interested in the equations, they are generated by the model. Once again, the model is the simplest possible extension of the sfc_models framework to allow business sector investment. This was accomplished by taking the simplest (non-trivial) SFC model from Monetary Economics, and only modifying the business sector. If we look at the more advanced SFC models in Monetary Economics, there is a well-developed financial system. In the interest of simplicity, there is only a single non-interest bearing financial asset ("money"). This has the side effect of eliminating the issues of capitalist finance, which will be discussed later. Model SIM largely eliminates discussion of the determination of prices; the price of goods is assumed to be fixed, and we only track the nominal income flows in the economy. (Since the price level is fixed, nominal activity is interchangeable with real activity.) The new model largely follows that convention, although wages are now allowed to changed, as discussed below. However, these wage changes are largely cosmetic, and so what matters are the nominal income flows. The household sector receives wage and dividend income, on which it pays tax. (The addition of dividends is new to this model.) It consumes goods (produced by the business sector), with a basic consumption function that is determined by after-tax income and the stock of wealth. There was no attempt to model constraints on the labour force: it was assumed that there was always unemployed labour that could be drawn in by new hiring. The government sector is the supplier of money, and imposes a uniform tax of 20% on household income. (The business sector does not pay tax, which is unfortunately realistic.) It also consumes goods by the business sector, and this government expenditure is a policy decision that is determined outside the model (an exogenous variable). In the analysis of model SIM, we see that there is a multiplier from government consumption to overall activity. In the current model, I am keeping consumption fixed so that we can see the effects of changing trends in investment. The changes to the model show up in the business sector. In model SIM, business activity was straightforward: it produced as much goods as was demanded by households and the government, and managed to make no profits when doing so. (The sfc_models framework extended this to allow for non-zero profit margins, which entailed the need for dividend payments to recirculate profits back to households.) Production is linearly proportional to labour hired. Complications were added on a number of axes. Since we assume that decisions in the current period are based only on previously known information, lagged variables are used extensively in business decisions. The production function is no longer a linear multiple of hours worked. It is equal to a productivity factor times hours worked, with the productivity factor equal to the square root of the capital stock (measured in real terms) divided by hours worked. This ends up at a very neo-classical looking production function where output is equal to the square root of capital times the square root of hours worked. Since productivity changes, keeping wages constant would imply widely varying profit margins -- possibly negative. Normal post-Keynesian arguments is that selling prices are set as a mark-up over production costs; in order to keep the model accounting simple, wages were set as a mark-down: wages are set so that businesses keep a constant profit margin (taking into account depreciation costs as well). Rather than track the profit accounting of inventories, the business sector uses a simplified profit measure that assumes that the cost of goods sold matches the current period's production cost. Dividends are paid based on the previous period's profits and cash holdings. Post-Keynesians typically argue that business decisions are made based on conventions; the model is based on convention. There is a target capital/hours worked ratio. In the initial steady state, this ratio is one. The implication is that the capital stock is equal to the hours worked, and so the variables production, capital and hours worked start out at 100. There is a target inventory/sales ratio. (This is a stock-flow norm, as it a target relationship between a stock variable (inventory) and a flow (sales). 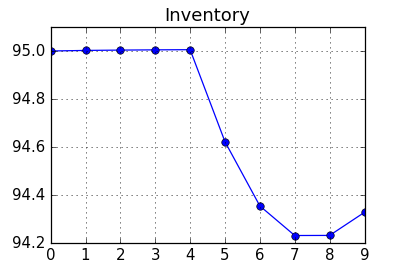 The value in the simulation is one, so that the target is to hold one period's sales as the stock of inventory. The model I created is hardly perfect, but it has some features that may cause me to rebuild it before publication of my book on recessions. However, it does fit my target of being possibly the simplest possible model. In no particular order, I would note the following points. It would have been preferred to take an existing post-Keynesian business cycle model. The issue is getting the model to fit within my Python framework. The behaviour of wages is non-intuitive. A more standard post-Keynesian approach would be to fix wages, then set selling prices as a mark-up. The difference shows up in the initial investment rise in period 5 as wages actually fall when hiring picks up. The reason is straightforward: labour hours rose versus steady state, while capital is still at the steady state value in period 5. Correspondingly, productivity falls, and so the hourly wage drops. If wages were fixed, we would end up with a more sensible-looking inflationary jump in selling prices in response to lower productivity. The sfc_models framework does not have built-in support of inventory accounting (yet). Rather than build an entire accounting system into this model, an approximation for profits is used: prospective profits based on the current cost of production, not the historical cost of production. Splitting the household sector into a worker and capitalist sub-sectors would allow for a different propensity to consume out of wages versus dividends. This may allow for a more rapid consumption response to investment increases, under the usual Keynesian argument that households have a higher propensity to consume out of income than out of dividends. The initial steady state was found by trial-and-error, and it would be preferable to analytically develop equations to describe the steady state. This preliminary model demonstrates how that income flow effects will tend to magnify the effect of changes to fixed investment on overall growth. This allows for moderate business cycles. We need to add financial considerations to the picture to generate greater volatility to the investment cycle. This brings us closer to Keynes' description of the cycle. The code to generate the simulations is found at: https://github.com/brianr747/SFC_models/blob/master/sfc_models/examples/scripts/ex20190131_investment_accelerator.py (requires installation of the package). Note that this script was added after the Python module was uploaded to PyPi (the Python package repository), so it will not show up in the earlier versions. It will eventually show up once a new version is uploaded. At the time of writing, the model features a fair number of hard-coded parameters, and the new equations are not heavily. I hope to clean up the internal documentation once I am satisfied with the model implementation. The extra functionality was generated by sub-classing the original business sector object, a procedure that is described in Section 7.4 of my book. The class has arguably too many equations added to it, but that is the result of not having added support for handling the accounting of inventories. In case any of you really like equations. The following is the set of reduced equations that are produced by the sfc_models framework. For those of you who are unaware, the sfc_models framework is unusual in that the user specifies the economic sectors as code objects, and the equations are generated by the module.